With Google Docs, we’re always trying to make you more productive—and part of that means making it possible for you to get things done from anywhere, at anytime. 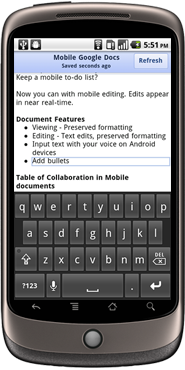 That’s why we’re excited that the new documents editor now supports editing on your mobile browser. We’re rolling this out over the next few days. It’s easy to get started: visit docs.google.com in a browser on a supported device, and select the document you want to edit. Then, when you’re viewing it, press the Edit button to switch to the mobile editor. In the next few days, we’re rolling this out to English-language users around the world on Android with Froyo (version 2.2) and on iOS devices (version 3.0+) including the iPad. We’ll be adding support for other languages soon. 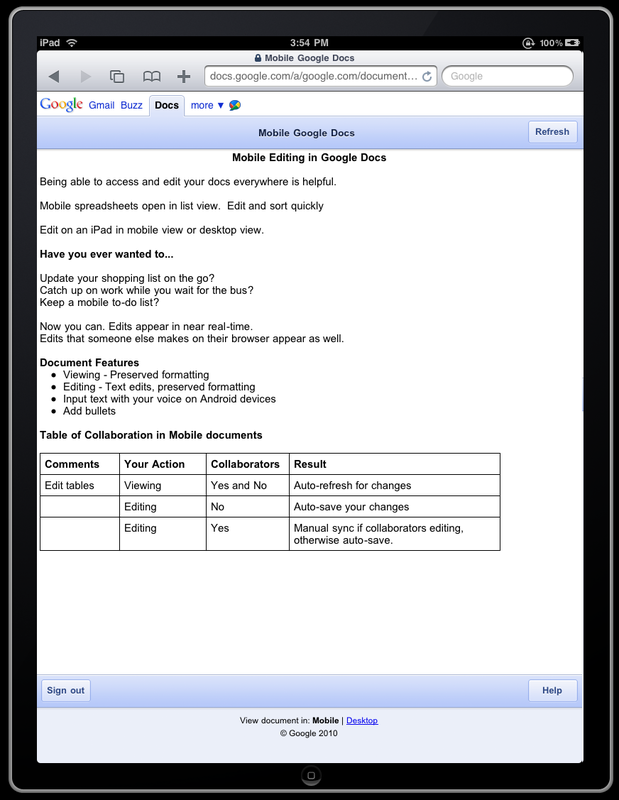 And as before, we also support editing of spreadsheets from your mobile device’s browser. We hope you enjoy editing your documents on the go—especially when you’re at the game with a hot dog in your other hand.